Whether you are a seasoned swimmer or taking your first dip in the water, you could always use a bit of help. Most guys do fine swimming on their own, but those who want a bit more control, power, and agility can invest in a pair of fins. These swimming accessories help swimmers move effortlessly in the water. They are crafted to mimic the fins of natural marine life, such as dolphins. That being said, fins aren’t just made for swimmers. Body board enthusiasts and divers alike can benefit from the power and control they provide. Churchill fins are some of the best fins you can get. They were one of the first swim fins ever crafted. Owen Churchill, a prolific Olympic sailor, created the first pair in 1936. Over the years, the company has perfected the design to create something that’s comfortable and incredibly effective. Guys can zip through the water effortlessly without having to sacrifice comfort. There are a number of different models to choose from. They differ in shape and thickness. Guys can choose a model based off of what they will be using the fin for. Some models are design with more flexibility to provide swimmers and divers with agility in the water while others have a more firm shape to provide maximum acceleration for body surfing. Despite the model you choose, all Churchill fins are crafted to be comfortable. One of the biggest complaints about swimming fins is the awkward fit and flexibility. Many fins out there will end up hurting your feet with prolonged use.Most fins make you choose between effectiveness and comfort. Churchill differs in its design and material. The company’s implementation of 100% natural gum rubber has allowed the fins to be firm, yet comfortable. Instead of choosing effectiveness over comfort, or vice versa, Churchill provides the best of both worlds. The flexibility and fit of the rubber allows you to get the most out of your fins without hurting your feet. Regardless of your skill level, Churchill fins are the way to go. 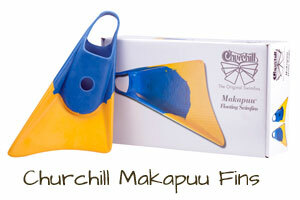 The Churchill Makapuu Fins are the original fins designed in 1936. They have a dolphin arc shape that provides great maneuverability and propulsion. 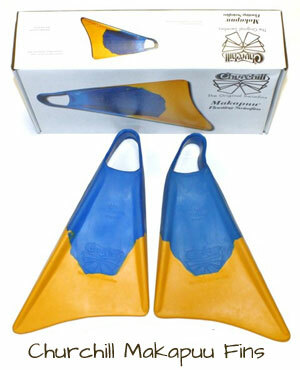 In fact, many professional bodysurfers use the Makapuu Fins due to the acceleration and control they provide. The fins are very well balanced compared to other fins out there. 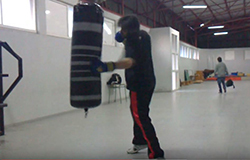 They can be used with any skill level for a number of different activities. They are in the mid power range. They provide a good amount of thrust while still being comfortable. Divers, bodyboarders, bodysurfers, and casual swimmers can use them to gain control in the water. In terms of comfort, the Makapuu fins are top notch. They can be used for a long session without leaving bumps and rashes on the feet like other fins. The natural rubber is thinner in the upper portion of the fin. The foot pocket is incredibly flexible and comfortable to use. The foot and heel portion is made from a softer gum rubber to provide cushion and comfort. The end of the fin is made from a more rigid rubber. While it is still flexible enough to move in the water, this stiffness provides propulsion and control. This combination of rubber thicknesses makes the Makapuu fins comfortable and effective. The Makapuu fins are also quite stylish. While it may seem awkward to walk around with fins on your feet at first, they actually look attractive in the water. They can come in a number of different color options. Most often, the foot cavity is colored blue while the end of the fin is a more vibrant color. With its angular shape, the fins look very rugged and sporty. They are eye-catching fins that look great in and out of the water. 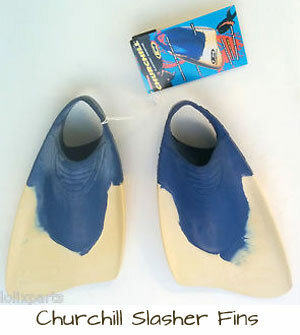 The Slasher Fins were the second pair of fins designed by Owen Churchill. They are in the same family as the Makapuu fins. They have the same style and dolphin inspired shape as the Makapuu. However, these fins are designed to have a higher level of comfort than the Makapuu. They are also a little less powerful than the original design. Because of this, the Slasher Fins are often described as “Mini Makapuu” fins. One of the most noticeable differences in the Slasher fin is the length. The end of the fin is much shorter than the Makapuu. This provides less acceleration in the water. However, it makes them more comfortable and easier to use. If you’ve never used fins before, the shorter length of the Slasher fins will allow you to get the hang of them before stepping up to the Makapuu. For added comfort, the Slasher fins have anatomically molded foot pockets. They are shaped to hold the foot perfectly, adding to the comfort. While most view the Slasher fins as a beginner fin, they have a few design elements that make it perfect for experienced bodyboarders and surfers. The fins have a sharp rail line on the outer edge. This provides greater control in the water. Surfers will be able to maneuver easily with the sharp rail line guiding them. Additionally, the shorter fin length makes it easier to lift the fin out of the water and onto a board. Much like the Makapuu fins, the Slasher fins come in a number of different colors. 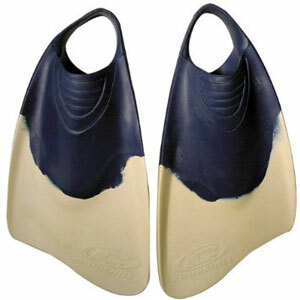 Additionally, the Slasher fins come in a couple of different fit choices depending on a surfer’s preferred style. Surfers can choose to get a shorter or wider fin to better accommodate drop-knee or prone surfing positions. Either way, the fins are a stylish option for beginners and professionals alike. While it may sometimes be seen as an inferior version of its older brother, Slasher fins have a number of design features that make them great all on their own. 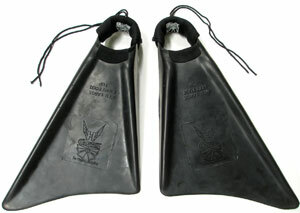 The Makapuu “Hubb” fins are a unique option for guys who are serious about their sport. These fins are the signature swim fins of Jeff Hubbard. Those who are familiar with bodyboarding need no introduction to the legend. He is the two-time world champion of bodyboarding and is known by many as the best in the world. He’s known for his control in the water and ability to get big air. He partnered with Churchill to design these fins. Because the Hubb fins are considerably more rigid than the Makapuu fins, they have a number of comfort features that allow bodyboarders and swimmers to use them for long sessions. It has a neoprene foot pocket that conforms to the shape of your foot. This extra cushioning provides a custom fit that is comfortable and tight. It also has ankle pads to prevent rashes and bumps. These pads make up for the added rigidity in the fin. Without it, you’d be left with injuries and rashes. There are also some fin tethers to ensure that you don’t lose them. While these fins do float, they are designed to provide maximum speed. The tethers will help the fins stay with you in even the toughest wipeout. The Hubb fins are very similar to the classic Makapuu fins. In fact, they are often difficult to tell apart at first glance. They share the same dolphin arc design. The difference in the Hubb fins is their power. While Makapuu fins have a medium power and propulsion rating, the Hubb fins have medium-high power. They are crafted with the same natural gum rubber. However, the Hubb fins are considerably stiffer. This provides greater acceleration and power in the water. It is what allows Jeff Hubbard to get the air he is known for. Why Are Churchill Fins the Best? 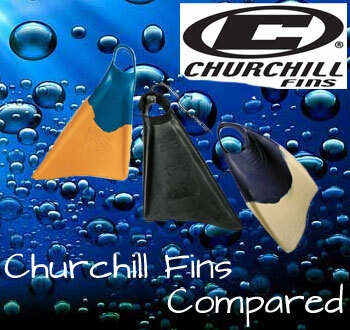 Churchill fins are the best swim fins available simply because they excel in all the areas that matter. The brand has a long and illustrious history. Churchill not only patented the original design, but they’ve continually improved design elements to make them effective and comfortable. 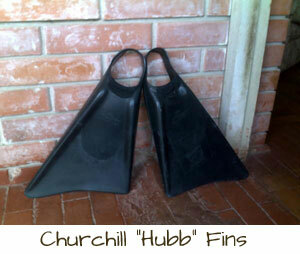 Churchill fins are known for marrying comfort and power. Usually, there’s a trade off between the two. Fins will either be too extreme or too comfortable. They’ll either provide too much power, causing you to lose control and experience unpleasant injuries, or they will be too flimsy and ineffective. Churchill has perfectly balanced the two to provide a truly unique fin. Regardless of the model you get, the fin will be comfortable while still providing you with the power you need. The eco-friendly rubber will keep your feet comfortable during any session. Swim fins are designed to enhance your natural ability in the water. They give you control, agility, and speed. Whether you are bodyboarding or just taking a dive, Churchill fins will make your experience in the water a memorable one. The dolphin inspired design will allow you to move through the water as if you’ve spent your whole life there. They’ll make your swimming kicks more effective and provide you with the thrust and speed you need to do that gnarly trick. To sum up, Churchill is the best because they not only originated the design, but they are constantly setting the standards for every other fin out there.